Do you feel like your team practices throwing all the time only to lose games because they can’t throw? Discover how this Bang the Bucket Drill will reinforce accuracy instead of simply release. Throwing a ball involves more than simply releasing a ball – it means your teammate can successfully make a play on her end. Discover how 2 buckets can make throwing accuracy challenging and fun. 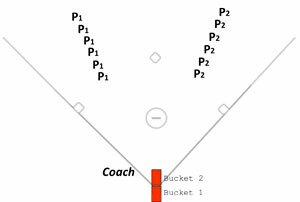 Split your team up into 2 groups, one goes to shortstop area and the other to 2ndbase area. Everyone has their glove on. 1 coach is at home with a bat and a bucket of balls. Directly on homeplate are 2 buckets, one placed on top of the other. Once you’ve got everyone in place and your 2 buckets placed on top of each other on homeplate, you’re ready to start the drill. Your players will get immediate feedback on the accuracy of their throws without the benefit of the receiver making a remarkable catch. The buckets are unforgiving, meaning, they just sit there, so your players either hit them or they don’t. And while this might sound harsh or difficult, you’ll be amazed at how quickly your players will make adjustments to enable them to hit the buckets and help their team. You can either play to a certain point total – say, first team to 12 wins. Or, you can play through each line twice and the line with the most points wins. NOTE – one thing I like to do to encourage teamwork and verbal support, is to give an additional +4 BONUS POINTS for the line (or team) cheering the loudest throughout the drill.